KIRSTEN LEARNS: WHAT IS HIGH POWER BUS BAR TRUNKING? For a long time, cables were used for transporting electricity current from one point to another point. Thanks to better technology, another superior alternative arrived in the form of busbar trunking system (BBT) which performs the function of transporting current more effectively and safely from one point to the other. Busbar trunking is defined as a prefabricated, modular system that is designed to carry as well as distribute electricity. The USP of BBT lies in their ability to tap off power to switchgear for further distribution using the tap of boxes. Modern busbar trunking comes totally enclosed with prefabricated sections consisting of copper or aluminum bus bars with current ratings ranging from 25 to 7500 A.
Busbar trunking provides several advantages over conventional forms of power distribution. EASY TO ESTIMATE: The technical characteristics and price of each component are always known. This along with the extreme simplicity of busbars makes it possible to estimate its costs from the design/estimation stage through to installation on-site and running operations. SOUND PLANNING: It’s easy to plan that further also ensures that the power distribution system can be precisely planned from the total load rating and the type and number of type and number of loads. FLEXIBILITY: They are quick to install and flexible to use. Further, they bring about an economy in energy consumption in any building. They also provide for easy expansions, changes, replacements and reusing in future. REDUCES INSTALLATION TIME: It greatly reduces on-site installation times when compared to hard-wired systems or costly cable installations. This saves time and money and also practically rules out installation errors thanks to its safe and user-guided connection technology. INCREASED SAFETY: It offers several safety features due to its incorporation of high-quality manufactured components. VERSATILITY: They can be installed with natural galvanized, aluminum or painted finish for an aesthetic touch. Further, special colors can be used to match switchboards. COMPACT: When compared to cable or such like items, they are far more compact. This allows them to cut down on unnecessary allowances during installation. ADAPTABLE: Being extremely sophisticated, they can be used in difficult environments, with certain changes to the type of busbar component used. ALL-ROUND EXCELLENCE: They do not burn nor carry flames or generate poisonous gas in case of a fire accident. On the other hand, cable systems can burn and cause a fire to spread out in a building (especially in high-rise buildings and shopping centers). NO CHIMNEY EFFECT: They do not have chimney effect due to their compact structure or pre-installed inner fire barriers. A network configuration that is straightforward. Easy and flexible retrofitting during times of location change or consumer loads. Possess high short-circuit strength and low fire load. Does not require any kind of special tools for handling or for any other works. A premier copper foil manufacturer, Bhagyanagar India specializes in busbar trunking systems with high tap-off densities catering to industrial and commercial buildings. They come with a good degree of protection that works whatever installation method is used. 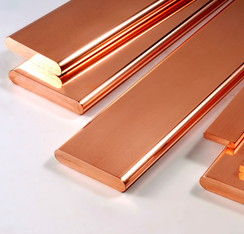 Since its inception, Bhagyanagar India has become a leading copper foil manufacturer specializing in copper busbars and copper foils. Further, its high power busbar trunking systems have proved themselves to be a flexible and efficient solution in many applications, especially for controlling the complex area of building management and industrial applications, from commercial centers to shopping malls, hotels, data / logistics centers, tertiary buildings, hospitals, educational institutions, etc. Its copper foil and copper busbar products are used in a vast range of applications and have especially proved itself to be extremely reliable for distribution systems, power production, etc.